The global review of legal and institutional frameworks incorporates 28 transboundary surface water, groundwater and marine water systems covering the Americas, Europe, Africa and Asia. The report also considers climate change adaptation knowledge in the various water basins analyzed. April 2011: The UN Development Programme (UNDP) has published a global review of legal and institutional frameworks for 28 transboundary surface water, groundwater and marine water systems covering the Americas, Europe, Africa and Asia. The report also considers climate change adaptation knowledge in the various water basins analyzed. 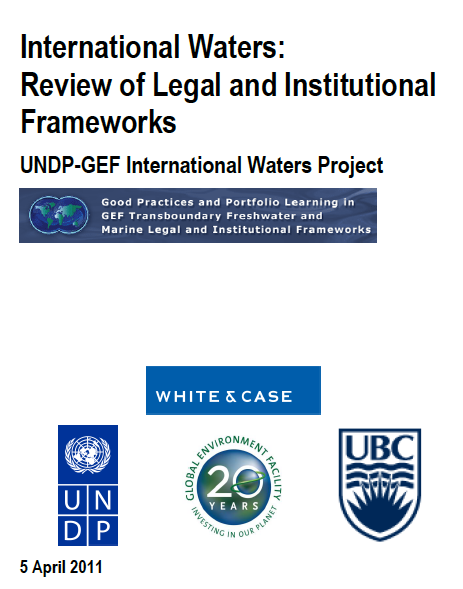 The report was prepared under the UNDP-Global Environment Facility (GEF) Medium-Sized Project titled “Good Practices and Portfolio Learning in GEF Transboundary Freshwater and Marine Legal and Institutional Frameworks.” The project, with a life-cycle of three years, seeks to facilitate good governance and effective decision making in international waters through the identification, collection, adaptation and replication of beneficial practices and lessons learned from a wide range of experiences. The project focuses on institutional harmonization and strengthening, capacity building in regard to integrated water management, and forecasting the hydrological impacts from climate change and the anticipated responses to these changes.